Yes, you’ve read the title correctly. 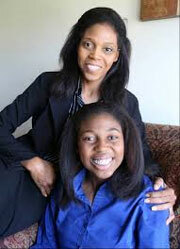 A 14-year-old girl is graduating from COLLEGE. Young Thessalonika Arzu-Embry, who lives on the Great Lakes Naval Base, will be graduating from Chicago State University with a bachelor’s degree in Psychology. Thessalonika actually started college at the age of 11 at the College of Lake County. She will end next month with the degree from Chicago State. With all of the talk about kids in Chicago not being prepared to succeed, this young lady is showing that there is a great deal of brilliance right in the heart of the south side of the city. Thessalonika doesn’t attend regular high school like every other freshman her age. She actually wakes up early with her mother, Wonder Embry, and makes the commute from home at the Great Lakes Naval Station near North Chicago to Chicago State on the South Side of the city. On the way to school, Thessalonika and her mother study theory and talk about homework assignments. Embry is set to graduate August 30th. Wish her luck! Thessalonika’s story reminds us that with hard work, family support and faith, you can do practically anything. Your age doesn’t define your intelligence or abilities. Never underestimate your potential.